Jamie Oliver does it again. 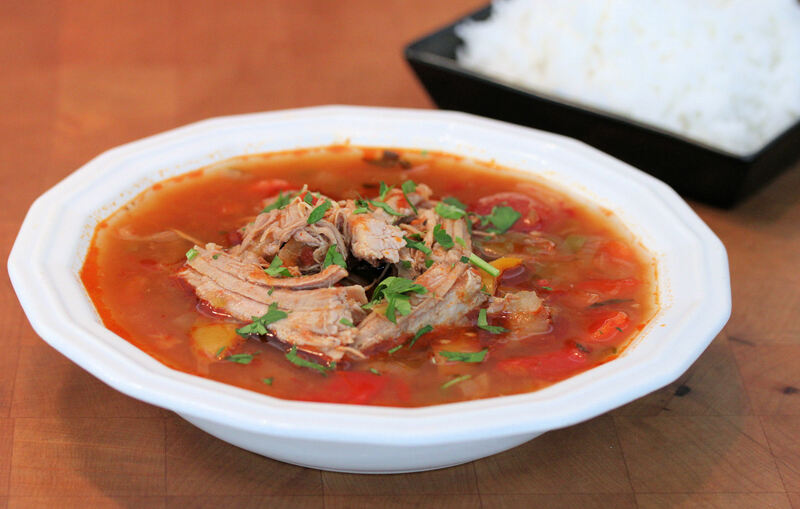 This is a fantastic stew with a unique balance of sweetness and spice. The bell peppers sweeten the dish as the chilies and caraway counter the sweetness with their spiciness. The addition of the red wine vinegar and smoked paprika also adds to the complexity of flavors going on. The pork? Just perfect. It is so tender and moist and absorbs all the greatness of the juices. You will want to make this again and again. *the recipe calls for red chilis, however, my market did not have them that day. i used serrano peppers and they definately added some heat. another note: per jamie’s recipe, he calls for a jar of grilled peppers, skin off. this translates to a jar of roasted bell peppers. in lieu purchasing store bought, roasting 2 peppers at home is a great alternative. go to ‘roasted bell peppers’ for a ‘how to’. Pre-heat the oven to 350°F. Heat a deep oven-proof stew pot or dutch-oven with a lid on the stove, 6-8 quarts. Pour in a few tablespoons of extra virgin olive oil. Score the fat on the pork in a criss-cross pattern all the way through to the meat, then season generously with salt and pepper. Add the pork, fat side down. Cook for about 15 minutes on a medium heat, to render out the fat. Remove the pork and set aside. Add the onions, chilli peppers, paprika, caraway seeds, marjoram or oregano and a good pinch of salt and pepper to the pot. Turn the heat down and gently cook the onions for 10 minutes. Add the sliced peppers, the roasted bell peppers, and the tomatoes. Make room in the pot for the pork and place it back in, rearranging the other ingredients if necessary to make it fit, then pour in enough water to just cover the meat. Add the red wine vinegar. Bring to the boil, put the lid on top, and place in the preheated oven for 3 hours. After the meat has stewed for 3 hours, remove the pot from the oven and check the meat. It is obviously done when the meat falls apart with 2 forks separating it. If it does not fall apart, put it back in the oven and check it every 20 minutes. When the meat is nearly ready, cook the rice per package instructions. Meanwhile, stir together the sour cream, lemon zest, and most of the parsley. Add a squeeze of lemon juice for a bit more tang if desired. When the meat is done, remove the pot from the oven and taste. Season with salt and pepper, if necessary. 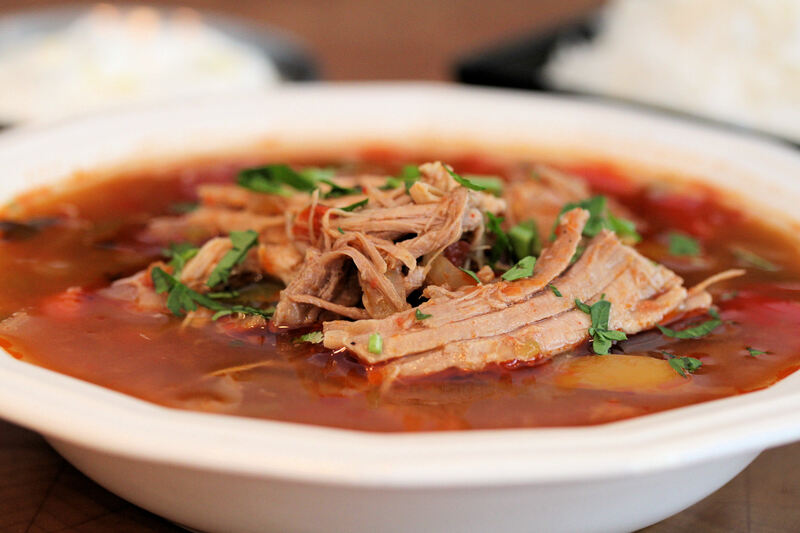 Gently break apart the pork in small to medium shreds and stir around to absorb the juices of the goulash. Serve in a bowl with the rice on the side or in the stew. Sprinkle with the remaining parsley and the flavored sour cream on the side. Serve immediately. 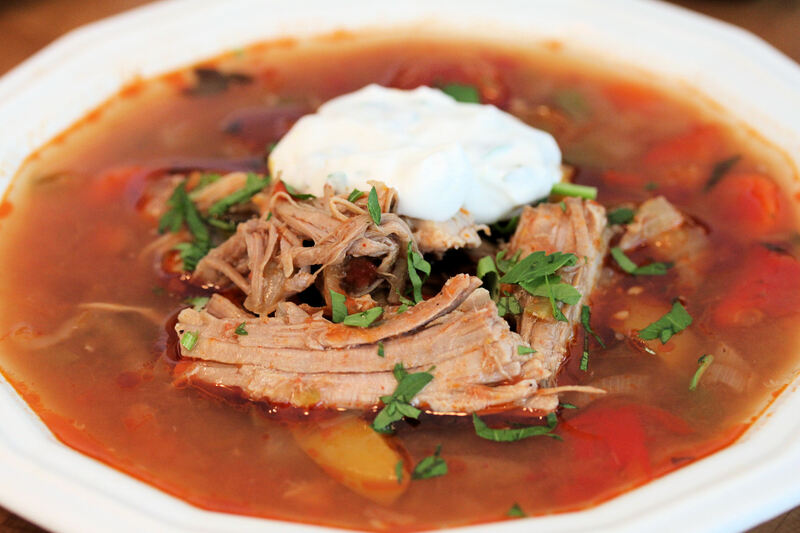 This entry was posted in comfort food, roasting recipes, soups and stews and tagged football, football recipes, game day food, jamie oliver, jamie oliver recipes, pork stew, soups and stews, spicy pork and chili stew, spicy pork and chili-pepper goulash, stew recipes, superbowl. Bookmark the permalink. Found this recipe in the comfort food category strangely. By that I mean it wouldn’t be what I class as comfort food myself, unless you know 7 other people who need comforting with you at the same time. 😉 Comfort food is meant to be decadent and a bit naughty I think.